Alek Wek is a South Sudanese British model who first appeared on the catwalks at the age of 18 in 1995, sparking a career lasting to date. She is from the Dinka ethnic group in South Sudan, but in 1991 she and some family members fled to Britain to escape the civil war in Sudan. She later moved to the United States. Wek was born the seventh of nine children in Wau in Sudan (now South Sudan) in 1977. When she was preparing to emigrate from Sudan, her mother picked the date April 16, which occurs in the rainy season during which she was born. She says her name means "Black Spotted Cow". Wek was born to her mother (b. 1946), a housewife, and her father Athian Wek (1933-1985), an education official. Alek Wek has stated that physically, she resembles her father, who also had unusually long limbs. Athian Wek once broke his hip in a bicycle accident; his hip was repaired with metal pins. When the civil war broke out in Wau in 1985, the Wek family had to flee from both rebel and government forces. Long periods of walking caused Athian Wek's hip to get infected, and upon the family's return to Wau, he became paralysed and endured a haemorrhage. He died in hospital in Khartoum. Wek was discovered at an outdoor market in London in 1995 in Crystal Palace, London by a Models 1 scout. She first received attention when she appeared in the music video for "GoldenEye" by Tina Turner, in 1995 and from there entered the world of fashion as one of its top models. She was signed to Ford Models in 1996 and was also seen in the "Got 'Til It's Gone" music video by Janet Jackson that year. She was named "Model of the Year" in 1997 by MTV. 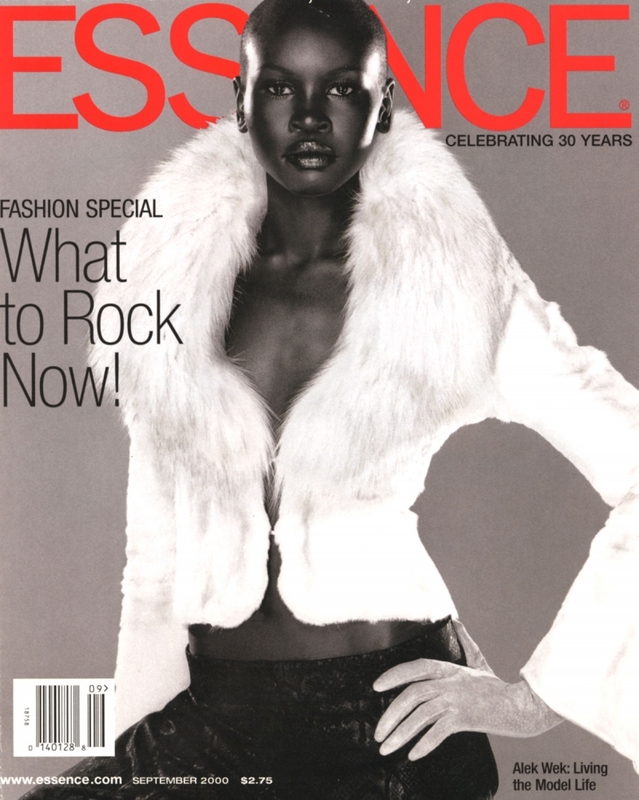 She was the first African model to appear on the cover of Elle, also in 1997. Amongst other things she has done advertisements for Issey Miyake, Moschino, Victoria's Secret and make-up company Clinique as well as walked the runway for high-profile fashion designers Shiatzy Chen, John Galliano, Chanel, Donna Karan, Calvin Klein, Jasper Conran and Ermanno Scervino. In walks for Christian Lacroix, she took the role of the bride on several occasions. In 2002 she made her acting debut in The Four Feathers as Sudanese princess Aquol. Herb Ritts photographed her for a 1999 calendar in a Joanne Gair body painting that was a highlight of Gair's first retrospective. Wek has also been a guest on both The Tyra Banks Show, America's Next Top Model and The Janice Dickinson Modeling Agency. Wek also designs a range of designer handbags called "Wek 1933", which are available throughout selected Selfridges department stores. The year refers to the year her father was born. Her inspiration for the designs came from the brass-clasp briefcase carried by her father. Wek is a member of the U.S. Committee for Refugees' Advisory Council and is helping to raise awareness about the situation in Sudan, as well as the plight of refugees worldwide. In July 2012, she will be returning to South Sudan with the UN Refugee Agency to highlight the stories of refugees returning from the north and the massive efforts needed to build and stabilize the country.